How do you attract responsive leads for your real estate investing business – and close deals with these people? 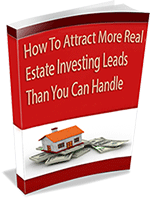 As a real estate investor, your primary objective is to attract targeted, responsive leads. No business can grow without a fresh supply of leads. In this article, we will tie how a real estate investing website is a critical part to attract leads and nurture them till you close deals with them. In real estate investing, if you run the “We Buy Houses” business model, the main types of leads we attract are people looking to sell their houses – in other words, motivated sellers. The more leads you generate, the more deals you stand to close, and the more money you stand to make. Once you generate those leads, how do you handle them? In order to maximize your profits, you must attract targeted, responsive leads. You must then engage these leads carefully to sign them up. Then you must carefully nurture them so they warm up enough to close deals with you. Your goal is to treat every lead as gold, and to follow through with them until you close a deal. This is the subject of this article. 1) Why do you need a real estate investing website? And not just any website – it must have certain tools that will run and build your business. Anything less can cost you thousands of dollars. According to B2B Technology Marketing Community, 61% of marketers say their biggest challenge is generating high-quality leads. Of course needless to say, you must be able to attract these leads cost effectively. Approximately 96% of people that visit your website are not ready to buy (Source: Marketo). This means you must have a way to efficiently capture their contact information (at the very least) so you can nurture them and warm them up enough to do business with you. Nurtured leads make 47% larger purchases than non-nurtured leads. (Source: Online Marketing Institute). You have to get them to trust you so they get comfortable enough to do business with you. This should be accomplished hands-off through carefully timed follow-up emails built into your website. Equally important, and crucial to the success of your business, you need an efficient method to convert those leads to closed deals. Unless you can close these deals, you cannot make any money. Most people start their search on the internet (like Google) before they ever call anyone. This includes people looking to sell their houses, or buy a new home. This is the first reason you must have an online presence – visibility. If you set up your business properly, most of you leads will come from the internet. Even if you also do offline marketing like postcards, you must employ an effective website to convert these leads. No letter or postcard can do this better than a website. Secondly, an effective real estate investing website must serve one primary purpose and one purpose only – to help you close more deals and make more money for you. Or why should you buy a website if it does not help you make more money? 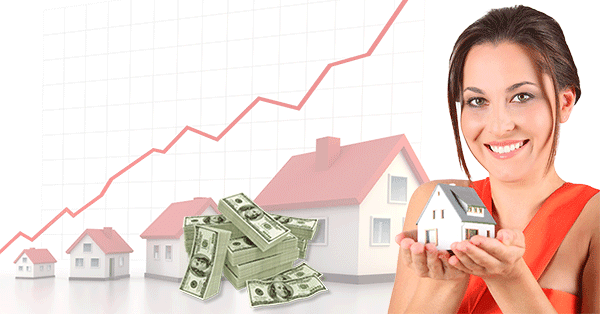 An effective real estate investor website gives you an edge over your competition. What Makes A Good Real Estate Investor Website? 1) Attract targeted leads to your website: – We will cover exactly how to attract a continuous flow of fresh, targeted and responsive leads from the internet. This is the lifeblood of any business. 2) Engage these visitors to take action on your website: – Approximately 96% of people that visit your website are not ready to buy (Source: Marketo). They may be willing to provide contact information in exchange for valuable content. We will use the power of a good website well equipped to do this for us. We must persuade these visitors to stick around in less than 10 seconds. Our goal is to make sure they sign up on our website. Your website must be well equipped to handle this. 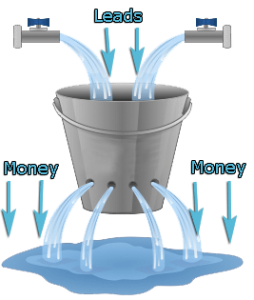 Or would you like to lose your leads to a leaking bucket? 3) Nurture these people with automated marketing: – Most people have to know you and trust you before they can do business with you. Of the people that sign up, 73% are not sales-ready. 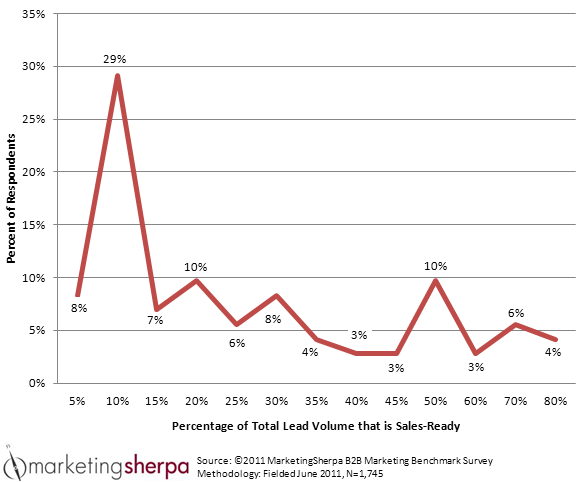 (Source: MarketingSherpa). Companies that excel at lead nurturing generate 50% more sales-ready leads at 33% lower cost. (Source: SalesForce). 4) Close deals: – We can only make money if we close those real estate deals. This is our ultimate goal on which the success of our business depends. To generate leads for you, and to convert them to closed real estate deals – making you more money. We also understand that real estate investing and internet marketing are changing all the time, and that the dynamics that worked a few years ago may not be applicable today. So we make sure that each website is designed by the best conversion experts in the world to attract and convert more leads for you. As we discuss how to attract leads and convert them to closed real estate deals, we will take a look at the features that set these websites apart, and how you can take advantage of these powerful features to attract more leads and close more deals. If you already have one of our websites, chances are that you are already aware of this, or that you do see all these features on your website but you have not paid attention. Most importantly, you do need to ensure that all these features are activated on your website to give you an edge. Otherwise you could be losing out on a lot of leads, closed deals and losing money. More Leads Than You Can Handle? Free Ebook reveals a "hidden" treasure trove of super motivated sellers ready sell their houses in your local market. No other investors know about these hot leads. You can afford to get picky and take only the low hanging fruit closing the most profitable deals. Enter your email below to receive this Ebook FREE instantly! SUCCESS! Ebook has been sent to your email. Effective lead generation is the one that attracts targeted, responsive leads at minimum to no cost. When your website attracts targeted leads, you get website visitors who have a keen interest in what you have to offer. If you buy houses, then you are likely to attract targeted motivated sellers who are looking to sell their houses. The more targeted they are, the more responsive they are – more of them will sell you their houses. Effective lead generation is accomplished by both Inbound Marketing and Outbound Marketing. In Outbound Marketing, you spend money to market your website through offline marketing, pay per clicks and social media such as Facebook Ads, and others. With this type of marketing, you just need to polish your game so you attract as many leads as possible at the lowest cost. Then your website should be able to handle these leads effectively. We’ll cover this shortly. In inbound marketing, your website attracts leads for you from the internet. This is why our websites are delivered equipped to actively attract leads for you on the internet, without you having to spend any money to get those leads. You just need to need to give your website a little push to attract leads for you. More about that in a minute. Getting more targeted, responsive traffic to your website. This is really free traffic. Converting most of these leads into people that actually do business with you. Doing more deals and making more money. We have honed our expertise in SEO and online marketing with many years of experience that we practice every day. We have poured this experience into developing a website system with advanced SEO. This means that every page tells its own story both to people and to the search engines. To the search engines the page title and description on the meta tags must tell the same story as the rest of the content on the web page. 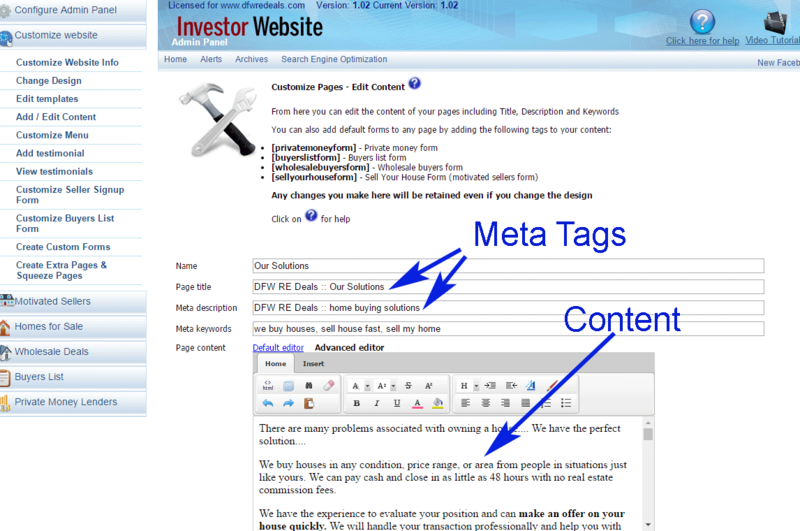 This means that the relevant keywords are well represented on that page both in the meta tags and content. This is called on-site optimization or on-page optimization. When you receive your website from us, it is already optimized for search engines. When people search for your services on the search engines, they can only find you if your website has been indexed by the search engines. Before we deliver your website to you, we submit it to Google and Bing so people can find you. When a person searches for a relevant term on a search engine, they can get hundreds of thousands of search results. When I do a search for “sell my house in Dallas Texas“, I get more than 6 million results. So what determines which search result I click on? The websites that rank at the top are more visible and they receive more visitors. Meaning a person looking for your kind of service is more likely to visit your website if it is among the first few on search engine results. This means that getting your website to the top of search engine results should be your top priority. Every single website needs a little extra push for this to make sure you rank well both in local searches where you do business and organic searches. When you get one of our websites, you also get tons of resources to guide you through the process of making sure your website is more visible on the search engines. How can you attract more real estate leads through SEO? 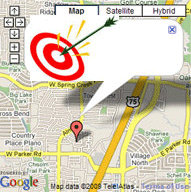 The content on your website should be optimized targeting your local market. This means the leads you attract consider you as someone local who can solve their real estate problems. We do personalize each website and target the content to your local market. However, it is advisable that you personalize it further to really look local. Content marketing is key to attracting leads from the search engines. For this reason, each one of our websites is delivered with a well optimized WordPress blog so you can post content from time to time. Search engines love this and they will reward you for it. Search engines stress relevant, engaging content more than anything else in their rankings. Even though search engines emphasize relevant fresh content, back links are still very relevant. When other websites link to your website, search engines consider it to be popular and rank it better than less popular websites. Be careful how you do this, and only stick with high quality websites with content relevant to yours. 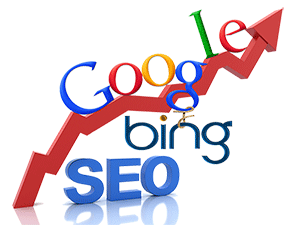 We do offer this SEO service on a limited basis. Making sure your website appears in local search engine results is one of the first things you should do. Take time to submit as much information as you can that you would like people to find about you. Include pictures, video, social media links, and so on. The more relevant and thorough you are in this process, the higher your business is likely to get. Remember that local search results appear before organic search results, giving you a lot of visibility in your local market. It takes just a few days for your business to appear in local search results. Recently I got surprised that a local submission I had done very poorly long ago and forgotten about it brought me 109 visitors and 6 sales in just one month. If I had paid more attention to it, maybe it would have brought me a lot of more business over the years. The picture below explains the different search results. 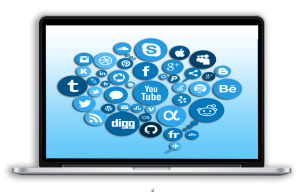 Our websites leverage social media to give you an edge over your competition, so that people can share your website and properties on social media. You can even collect your testimonials through Facebook comments where they can also share their comments with their friends. Networking is important especially when you wholesale deals to other real estate investors, or if you buy wholesale deals from other investors and fix them. Always make sure your business cards have your website address. OK, now that we have attracted leads to our website, what do we do with them? Websites that attract leads and convert them to closed deals. Mobile friendly. Now you have attracted a lead, and they have landed on your website. Then what? This is a very sensitive phase of any marketing that has to be handled right. Our websites are interactive, and direct response. The idea is to get that visitor to sign up so we can nurture them better. This means that your website engages that visitor from the moment they land with one goal in mind – to compel them to take a call to action such as signing up – without putting unnecessary pressure on them. As soon as a visitor lands on your website, they are engaged by a life-like, friendly, kind, down to earth speaking model that offers support whether you are buying or selling houses. It takes 20 seconds to capture the attention of a website visitor or you lose them for ever. The speaking models achieve this without putting any pressure on the visitors. The video below explains this better. When a visitor comes to your website, you must offer them a reason to sign up. Ebooks that provide information that can help your visitors works wonders for this. When you get one of our websites, it is delivered equipped with Ebooks already personalized with your name as the author to increase credibility. The signup forms are placed at strategic places on your website proven to offer maximum exposure and increase the chances that your visitors will sign up for them. This increases the chances that a lead will sign up – increasing conversion. These multiple calls to action increase the chances that they will take some action – giving you a chance to nurture them with follow-up messages. All the forms on the website are super easy to fill out. A good website should incorporate features like Google maps autocomplete. It becomes super easy to fill out an address. When a lead tries to fill out an address, they get suggestions, and all they have to do is tap to fill out the address. If a lead decides to call you instead, a phone number is always handy, clearly visible at the top of the website. On mobile devices, we always make sure the phone number is placed such that a prospect just needs to tap on it to place the call – thereby increasing conversion. Each website comes equipped with a variety of effective squeeze pages that you can use to collect leads on your website. This includes video squeeze pages that multiply the effect of your marketing. Of course, everything a website visitor can do on a website they can do better on a smart phone. We live in a mobile world. Most of your leads will come through mobile devices. Our websites are mobile responsive, and they are fully optimized for easy interaction of visitors on mobile devices. Does Your Website Attract And Convert Leads? Ready To Get A Website That Attracts Leads And Converts Them To Closed Deals? So what happens when a lead signs up on your website? They become a prospect – or someone who has warmed up just enough to find out more about you. The nurture phase is where your website works to build trust and rapport so they can be fully comfortable to do business with you. As we have seen above, 73% of these people who have opted in are not ready to do business with you yet. Our real estate investor websites are equipped to handle the job of warming them up for you hands-off. Most real estate investing websites get it wrong at this step. A good website must have inbuilt capability to automatically communicate and follow with prospects. Whenever a lead signs up on your website, such as to get an Ebook, they are still shy because they do not know you yet. Most of these prospects are not ready to be engaged with you over the phone yet. So what is the best time frame to wait till they warm up? Many statistics show that it takes 5 to 12 contacts before a cold lead warms up enough to do business with you. But here is the problem – A recent study by Microsoft shows that 89% of people give up by the time they make the fourth follow-up. 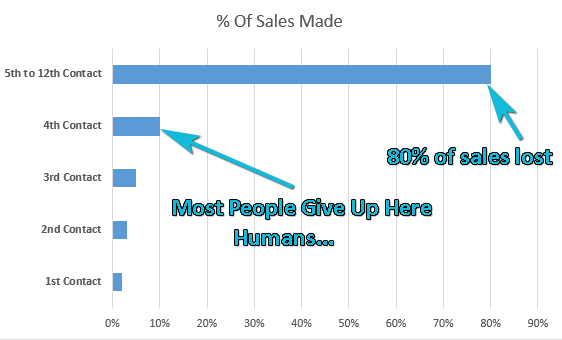 In other words, 80% of the sales are lost because people do not follow up! This is why you must have a website that takes over the follow-up headache for you. We are all human after all. To handle this, our websites come equipped with inbuilt follow-up autoresponders. Your website must take charge from the moment a lead signs up. 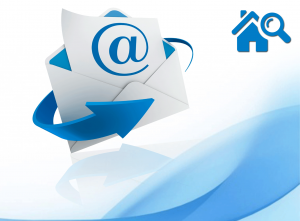 With our websites, your prospect now starts to receive friendly, carefully pre-timed email messages. These messages are written to provide help to the prospects and build rapport, thereby warming them up so they can do business with you. Your website does the heavy lifting for you when it follows up with your leads. By the time the prospect warms up enough to do business with you, a personal contact on the phone becomes very easy and friendly. 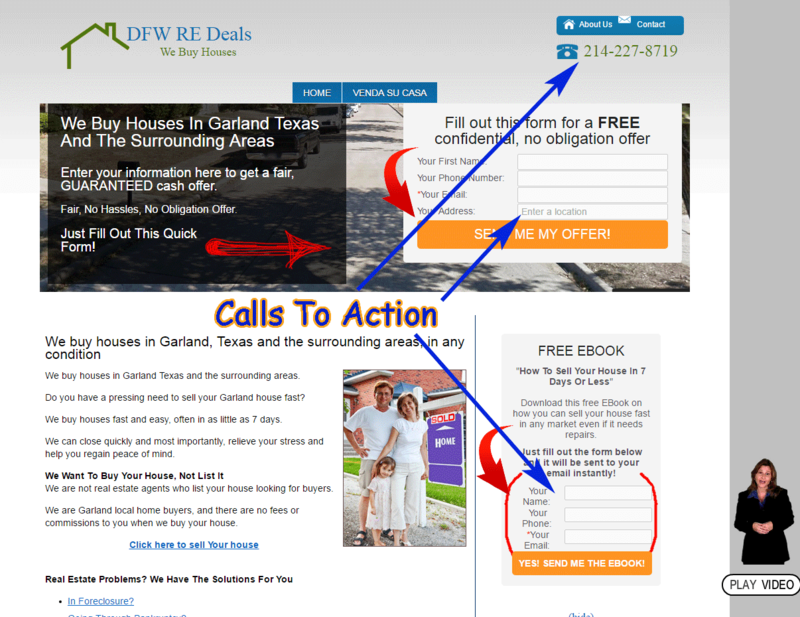 The capability to send these email follow-ups must be INBUILT in your real estate investor website. Our websites come pre-loaded with follow-up messages that are warm and friendly. They provide helpful information and at the same time prompt visitors to sign up or call you. Again – the capability to send automated follow-up emails must be INBUILT. But suppose you choose to order email services from Aweber, Getresponse, Constant Contact and so on? 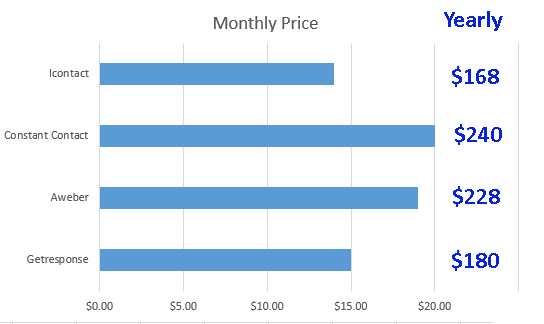 A quick check for the lowest priced email plans shows the following figures. You do not need to order an expensive third party email service for this – our websites are delivered already equipped for this, and all the emails are already pre-set when you receive your website. Of course you can change the messages or the timing if you need to. What about following up on the phone? Do not forget this trusted strategy once your leads are well warmed up. After all, this is how you will close most deals. All these steps are carefully choreographed with one goal in mind – Close real estate deals and make money. Of course, your website comes equipped with all the features you need to track the closing process from start to finish. When you receive your website it is fully set up and ready for business today. And of course we will hold your hand through the journey to make sure your marketing is up to speed to start generating those leads – and that you will use these tools to close more deals and make more money. 1) Attracting leads from the internet – search engines, social media e.t.c. You must have the right real estate investor website with features to do this perfected down to a science. Then you can start enjoying a steady flow of fresh leads that will continue to fuel the growth of your real estate investing business. 2) Engaging these leads so they take action on your website – The window of opportunity is 10 to 20 seconds, or you lose them for ever. We have to give them a compelling reason to sign up on our website. 3) Nurturing these people to with follow-up emails to build rapport and trust – They are not ready to do business with you yet. But they will be when we stay in touch 5 to 12 times with follow-up emails. During this time, we must send them messages that they find helpful to their needs, as we work to earn their business. We accomplish this with in-built follow-up features on our websites. 4) Closing the deals – When they have warmed up to us, we can now close the deals with them. This is the ultimate goal of any real estate investing business, and this is the only time we make money. What are you doing to attract more leads and close those deals? We would love to hear your comments below. Enter your email below to receive this Ebook FREE! Enter your email below to receive this Ebook instantly. Congratulations! Ebook has been sent to your email.